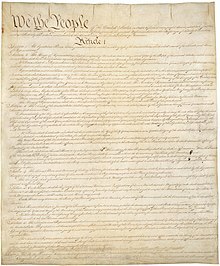 The Unitit States Constitution is the supreme law o the Unitit States o Americae. The Constitution, oreeginally comprisin seiven airticles, delineates the naitional frame o govrenment. This page wis last eeditit on 27 Juin 2016, at 00:25.